presented Claire Poumele, Council member from American Samoa and director of the American Samoa Port Administration, with a check for $94,000. 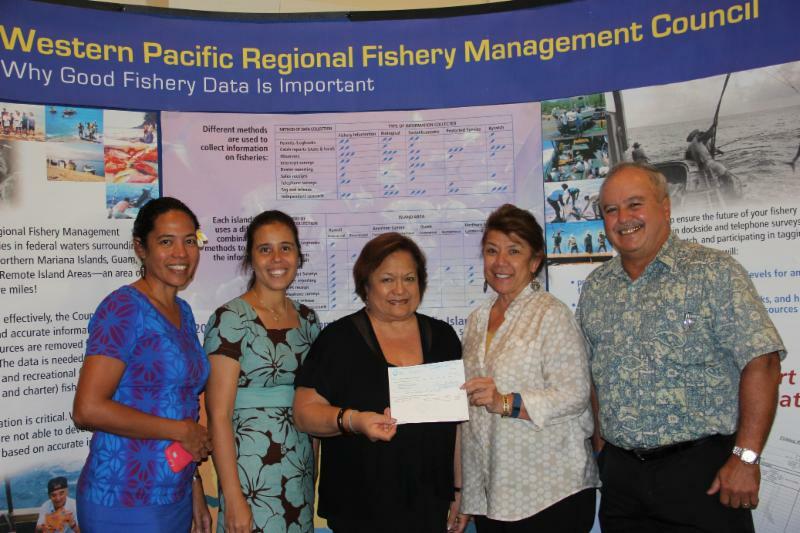 This is the second check provided by the Council to American Samoa to support development of a longline vessel dock extension at the Malaloa Marina in Pago Pago Harbor. The Council requested that the American Samoa Government make known the planned funding source that will be utilized for the construction of the dock and provide a timeframe to complete the project. Also regarding the American Samoa longline fishery, the Council requested that the National Marine Fisheries Service (NMFS) provide pelagic catch rates and other fishery statistics for the American Samoa Large Vessel Prohibited Area waters that have recently been opened to federally permitted, American Samoa-based longline vessels longer than 50 feet in length. These waters are 12 to 50 nautical miles (nm) from shore around Swains, Tutuila and the Manua Islands. The waters 0 to 12 nm around these islands and 0 to 50 nm from shore around Rose Atoll remain closed to pelagic fishing vessels longer than 50 feet in length. The American Samoa longline fishery provides albacore tuna (i.e., white tuna) to the canneries, which are major private-sector employees in the Territory. The canneries also receive skipjack tuna from US and foreign purse-seine vessels that offload in Pago Pago Harbor. On June 15, 2015, NMFS closed the US purse-seine fishery on the high seas and US exclusive economic zone in the Western and Central Pacific Ocean (WCPO) after its 1,828 vessel day limit was reached. A subgroup of vessels petitioned NMFS for an exemption. NMFS said an economic analysis on the impact of US purse-seine effort limits on American Samoa was needed before a decision could be made. The Council reiterated its recommendation that NMFS expedite this analysis and make a determination, so that an appropriate management decision is made on the attribution of US purse-seine catch or effort. The Council will also investigate potential negative impacts of recently signed free trade agreements to the domestic tuna canning industry and subsequently the economy of American Samoa. Concerned about the impacts of planned offshore wind farms on federally managed fisheries, the Council will ask to be included in the Bureau of Ocean and Energy Management (BOEM) Hawaii Intergovernmental Task Force. Lease applications for three projects have been filed and are under review by BOEM. The Council will work with offshore wind energy developers through the BOEM leasing process to ensure access to fishing grounds is not restricted and fishing is allowed near these wind energy structures. The Council will provide comments on fishing impacts during the public environmental review process and hold community meetings on the future of fishing on fish aggregation devices (FADs), several of which are located in areas near the proposed wind farms. Hawaii fishermen also face potential closure of fishing grounds in waters off Kaupulehu, on the Big Island. The proposal from Kona community members to the State of Hawaii includes bottomfish habitat 300 to 1,200 feet in depth that extends into the US exclusive economic zone. The Council took action calling for an assessment of the impacts of the proposed area closure on the bottomfish fishery and communicating the findings to the State. The Council will ask NMFS to prioritize Kaupulehu in its Kona Integrated Ecosystem Assessment (IEA) to determine non-fishing impacts in this area. The Council will also ask NMFS to expand the IEA effort to South Oahu and Mamala Bay (Barbers Point to Diamond Head) as these waters and their hinterland are areas of intense use by Honolulu’s population. Regarding Hawaii’s longline fishery for bigeye tuna, the Council asked NMFS to expedite the administrative rule making processes that allows the US Territories to allocate part of their bigeye tuna quota in the WCPO to the U.S. longline fleet based in Hawaii. In 2015, the Hawaii deep-set fishery experienced a two-month closure as it waited for completion of the paperwork. The US bigeye tuna quota could be reached as early as June this year. Local seafood consumers and retailers, as well as the fleet, would benefit from the transferred allocation as authorized under Amendment 7 of the Pacific Pelagic Fishery Ecosystem Plan. The Territories would also benefit with funds to support fisheries development. The Hawaii bigeye longline fishery has a low WCPO quota compared to other countries and operates far from the tropical waters where the majority of the bigeye fishing mortality occurs. Hawaii longliners operate north of the equator where bigeye tuna is healthy and subject to less fishing pressure. The Council will ask the United States to request that longline spatial management options be evaluated by the Secretariat of the Pacific Community and to have the Western and Central Pacific Fisheries Commission (WCPFC) Science Committee endorse this work program in 2016. The Council also asked that reports generated by NMFS for the Hawaii longline fishery include maps showing trends of catch and fishing effort over time because these would be useful for understanding spatial trends in the fishery. For the Hawaii bigeye longline fishery in the Eastern Pacific Ocean (EPO), the Council will work with NMFS and Inter-American Tropical Tuna Commission (IATTC) scientists to evaluate options to provide relief to the Hawaii longline fishery from tuna quotas that would not compromise conservation goals. The US quota, under which the Hawaii longline fishery operates, is 500 metric tons (mt) for vessels greater than 24 meters in length. In 2015, Hawaii longline vessels greater than 24 meters were prohibited from fishing in the EPO from Aug. 12 to Dec. 31 after reaching the quota. They were the only longline fleet to reach its quota and to be shut down in the EPO. The Council will ask the US delegation to the IATTC to propose that reporting of catches by countries be broken down by vessels greater than 24 meters and less than 24 meters, in the same manner as required by the United States. Regarding North Pacific EPO swordfish, the Council was tasked by NMFS to develop domestic measures and international recommendations to address the overfishing of this stock. The Hawaii shallow-set fishery that targets swordfish operates in the WCPO and not in the EPO; however, the Hawaii deep-set fishery catches EPO swordfish incidentally while targeting bigeye tuna. The Council noted that the fishing mortality is primarily the result of overfishing pressure at the international level; that Hawaii fishermen harvest an insignificant fraction of EPO swordfish; and that non-retention of EPO swordfish in advance of international action would disadvantage Hawaii fishermen while providing negligible conservation benefits. The Council, therefore, recommended continued monitoring by NMFS of the incidental catch of swordfish in the EPO by the Hawaii deep-set longline fishery, noting that any non-retention of EPO swordfish by this fleet is not warranted, particularly in light of its extremely small, incidental catch of the stock. The Hawaii fleet harvests about 4 metric tons of EPO swordfish, i.e., 0.04 percent of the total annual catch of swordfish in the EPO. In regards to international management, the Council will ask the US Delegation to the IATTC to propose that the IATTC eliminate overfishing on this stock by reducing the fishing mortality on North Pacific EPO swordfish by at least 10 percent. During the meeting, the Council heard from Sam Rauch III, the NOAA Fisheries Deputy Assistant Administrator for Regulatory Program, that observer coverage accounts for a significant portion of the NMFS budget. In the Hawaii shallow-set longline fishery, the observer coverage requirement is 100 percent, i.e., an observer is placed on every vessel and trip. The Council will examine the observer coverage levels needed under current management, in which the fishery is closed based on a specified number of interactions with sea turtles. The Council expects to act in its June 2016 meeting to consider recommending a reduced level of observer coverage in this fishery. The Council will also ask NMFS to identify the level of Hawaii longline observer coverage that would reduce data quality processing time lags and to devote more resources to relieve the observer data bottleneck that slows down the provision of observer data for science and management. The Council asked the Guam Department of Agriculture to review the information available from the enforcement reports on the sea cucumber harvest and report back to the Council in June 2016. The Department was also asked to include the fishing community in the development of Sport Fish Restoration Program funding proposals, projects and priorities. The Council staff and Advisory Panel will work with NMFS and the fishing community to develop a regional approach to developing a marine mechanics training and certification program. Recommendations by the Council that are regulatory in nature are transmitted to the Secretary of Commerce for final approval. For more information and a complete list of the Council’s actions, go to www.wpcouncil.org, email info@wpcouncil.org or phone (808) 522-8220. The Council was established by Congress under the Magnuson-Stevens Fishery Conservation and Management Act in 1976 to manage domestic fisheries operating seaward of State waters around Hawaii, American Samoa, Guam, the CNMI and the US Pacific Island Remote Island Areas.